It takes less than 30 minutes to have these soft, melt-in-your-mouth Baked Pumpkin Fritters on your plate. 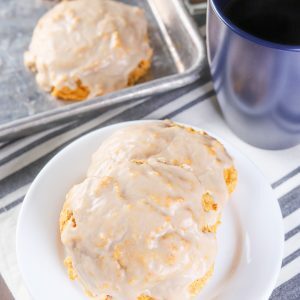 Top them with an irresistible maple glaze and pair with your favorite coffee or tea for a perfect fall breakfast! A few years ago I made baked banana fritters and loved how easy it was to make a healthier version of a fried favorite. 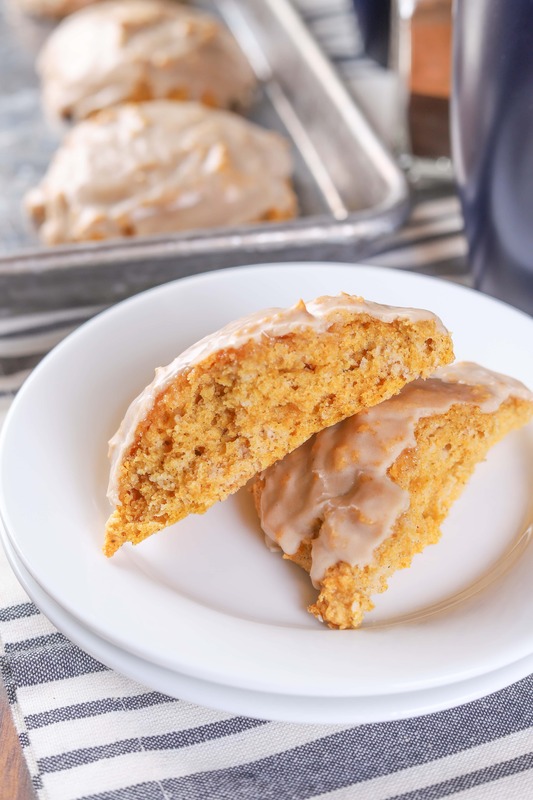 That fall a pumpkin version went on my ever growing baking list, but it just never happened. Now, over three year later, it finally happened! Soft, melt-in-your-mouth baked pumpkin fritters topped with a simple but completely irresistible maple glaze! This recipe is super simple to make. It is almost the same as making scones. You whisk together your dry ingredients, cut in your butter, add in your combined wet ingredients, and stir it all together until just combined. Then you add in the pumpkin until just combined, scoop the batter onto a prepared baking sheet, and bake. Simple. These baked pumpkin fritters are easy to whip up and have warm on your plate in less than 30 minutes! I like to have the fritters still warm when I dip them in glaze so that they are still warm when the glaze hardens and you bite into that soft fritter for the first time. Or if you don’t want to wait for the glaze to harden. just dig in to the soft, gooey glazed fritter. Either way, they’re delicious! While I normally am all for using whole wheat flour in recipes, I really recommend that you stick to white whole wheat. The texture is noticeably different, as well as the flavor. So, if you want to go all whole wheat, just know that it will change things. To get the batter on the baking sheet you can either use a 1/4 cup measuring cup or an ice cream scoop like this one. The measuring cup gives you more nooks and crannies in your fritters for the glaze to settle into once baked. I noticed with the ice cream scoop method I needed to flatten the batter just a bit before baking to allow the middle to bake without the edges getting overdone. Do not overmix. It will be tempting to mix the batter until everything is smooth. It’s a lot like a muffin mix where you just need to stir until combined. 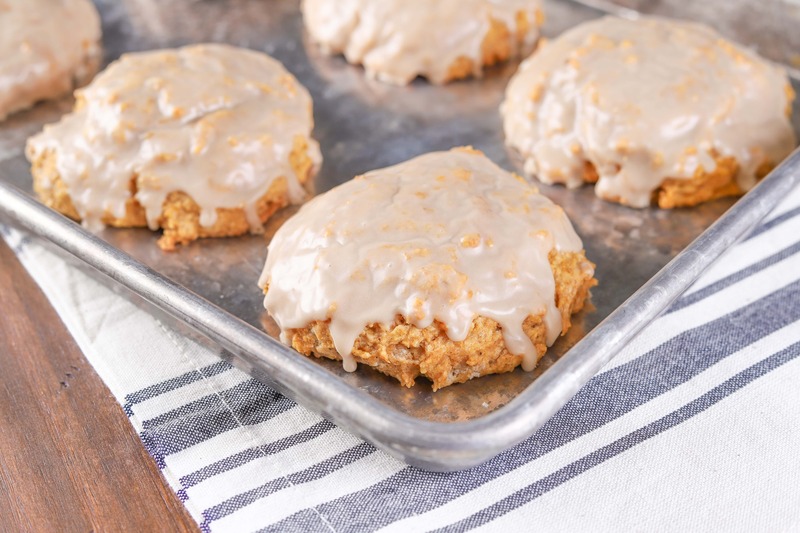 The end result may be some streaks of pumpkin in your fritter, but that won’t affect the flavor and you’ll end up with soft, melt-in-your-mouth fritters. Don’t like maple? 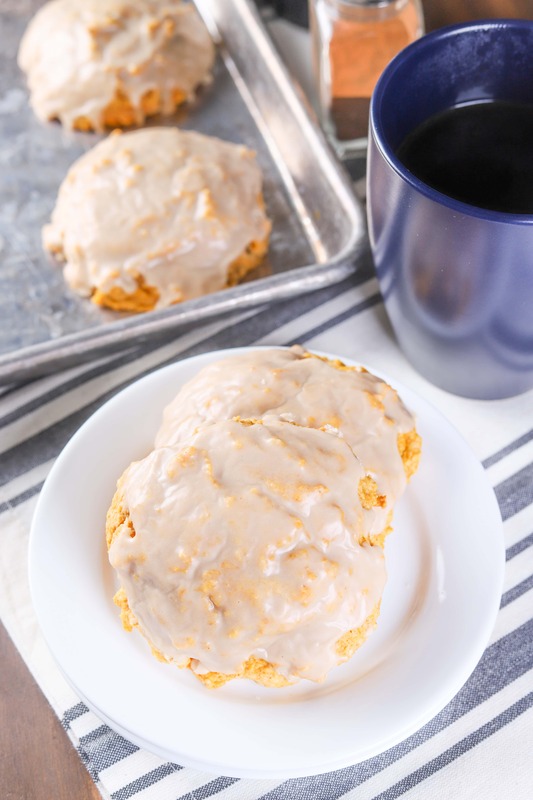 Swap out the maple extract for vanilla extract in the glaze. In a large bowl, whisk together flours, sugar, baking powder, cinnamon, nutmeg, ginger, and salt. Cut in butter with a pastry blender until mixture resembles coarse crumbs. In a small bowl, whisk together egg and milk. Add to flour mixture and stir to combine. Stir in pumpkin puree until just combined. 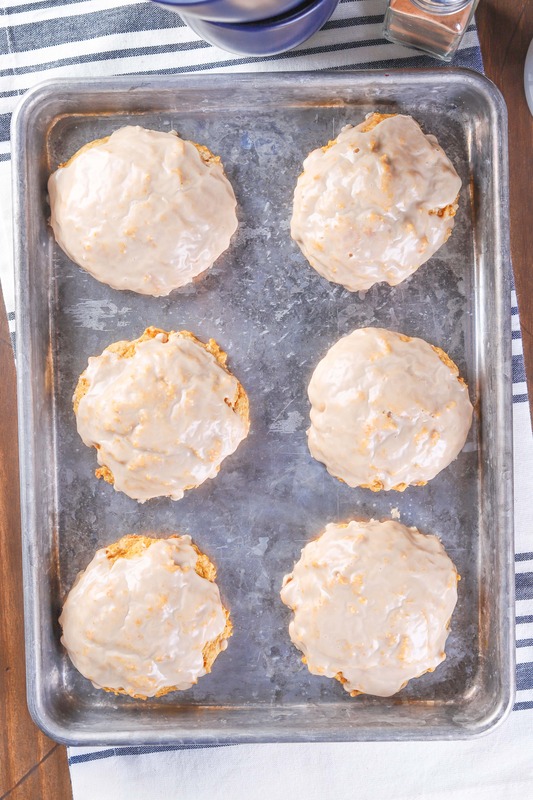 Drop by ¼ cup-full (or heaping tablespoon full) onto prepared baking sheet. While fritters are cooling, prepare glaze. Whisk together confectioner's sugar, vanilla extract, and 1 tablespoon milk until smooth. Add up to an additional tablespoon milk to reach desired consistency. Dip tops of warm fritters in glaze. Allow glaze to harden and serve.